Wayne Homes has announced Julie Zermeno as Sales Manager and Ryan Cousineau as Construction Manager for new Hartland location. 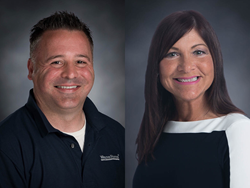 Wayne Homes has announced the hire of Julie Zermeno as Sales Manager and Ryan Cousineau as Construction Manager for the company’s new Hartland Model Center. Wayne Homes, an Ohio-based custom homebuilder, has announced the hire of Julie Zermeno as Sales Manager and Ryan Cousineau as Construction Manager for the company’s new Hartland Model Center. Zermeno joins Wayne Homes with 18 years of experience in the banking industry where she led teams to improve customer satisfaction through training and mentoring. Zermeno grew up in Mt. Morris, Michigan and currently resides in Clarkston, Michigan. She is excited to lead the new Hartland team and use her skills and previous experience in her new management role. Cousineau previously worked for a Detroit based general contractor as an operations manager and worked in construction with his father. He joined Wayne Homes in April 2017. “With over 20 years of land development and home building experience, Ryan brings a unique perspective to the team at Wayne Homes,” Regional Vice President of Construction, Jeanie Thomas, said. “Coupled with his work ethic and willingness to give customers the best experience possible, we felt he was the perfect addition to our family. His familiarity with the Michigan market and connections with many local trades will help us expand into Michigan." Cousineau grew up in Owosso, Michigan and attended Michigan State University. He currently resides in Clawson, Michigan. He is looking forward to leading the Hartland team and use his lifelong construction industry knowledge and skills. Wayne Homes is a custom home builder in Ohio, Pennsylvania, Indiana, Michigan, and West Virginia (see all Model Home Centers). We offer nearly 50 customizable floorplans and a team dedicated to providing the best experience in the home building industry. For more information, Ask Julie by live chat or call us at (866) 253-6807.